Tea Is For Turtle: Roll Up, Roll Up. Turtle's career as ringmaster in the travelling circus was short-lived. He was an audacious lion tamer, an impossibly good trapeze artist and his juggling skills were second to none. But there was something about the static inside the circus tent that made all the popcorn stick to Turtle's shell; and it's hard to dodge a human cannonball when you're covered in tasty snacks. 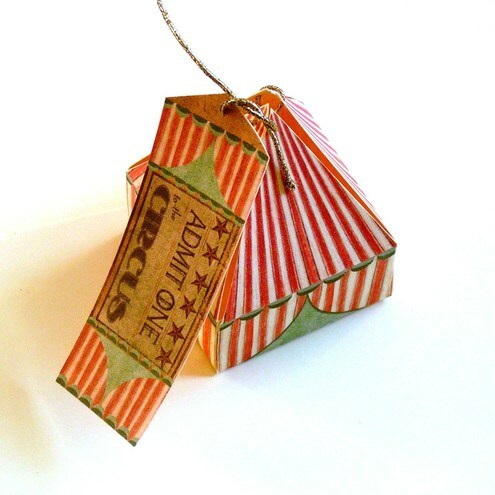 Circus Tent Gift Box from The Inklings of Tess. I love hearing about Turtles little adventures! This one caught my eye because I have been working on some circus ideas myself! Would love to see when you're done. Perfect - and what a great finishing touch to have a "ticket" as gift tag.